Long-term monitoring (LTM) describes the collection of data at a contaminated site over a prolonged time period. It is an important component of site management because the data are used to estimate trends in contaminant concentrations, evaluate remediation performance, determine if clean-up objectives are achieved, and even predict future changes via extrapolation. Since life-cycle costs for an LTM program can be high, long-term monitoring optimization (LTMO) is typically used to refine the data collection process and improve the overall cost-effectiveness of the program. Long-term monitoring refers to the collection of data from a contaminated groundwater site over an extended period of time (Fig. 1). Typically, groundwater is the medium sampled and the analyses focus on the contaminant(s) of concern. LTM programs are generally designed to meet one or more site-specific objectives, including documenting the performance of a remedy, ensuring that downgradient receptors are protected, or quantifying trends that allow extrapolation into the future. When LTM is implemented to assess the effectiveness of an active remedy, the term ‘performance monitoring’ is frequently used to describe the monitoring program. In these cases, longer-term performance monitoring may also be necessary because the remedy did not immediately achieve clean-up objectives, or because monitored natural attenuation (MNA) is being used as a follow-up remedy. Figure 1. Example of long term monitoring (LTM) data from 52 source zone monitoring wells at 23 untreated chlorinated solvents sites. Assess performance of a remedy (including MNA). Document that contaminant concentrations are decreasing over time. Verify that a plume is stable or shrinking, and monitor changes in plume boundaries. Estimate when concentrations will fall below the clean-up or compliance goal. Document that concentrations have met clean-up or compliance goals. Ensure that there is no risk to downgradient receptors. Track changes in secondary parameters that may aid in evaluating remedial performance (e.g., geochemical, microbiological, by-products). Monitor for changing conditions (e.g., hydraulic gradient) that would impact contaminant concentrations or otherwise influence progress towards project objectives. The key initial step in developing and implementing a LTM program is to define the site-specific objectives for the program. This is important for understanding what will constitute success or compliance, as well as to ensure that there are no risks to receptors. Since many LTM programs are focused on documenting remedial performance, these objectives are generally termed remedial action objectives (RAOs) and are established within the remedy decision documents. Preliminary remediation goals (PRGs) may also be specified and are similarly reliant on adequate LTM data. 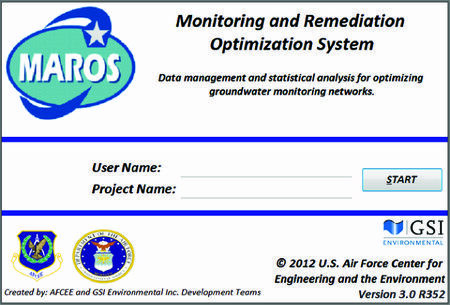 RAOs and/or PRGs for a particular site will include one or more of the general LTM objectives listed above, with the primary difference being that they will be more quantitative or location-specific. For example, they will typically specify a concentration goal that must be met, or a specific location where compliance is to be assessed. RAOs will also commonly include a time period within which the objectives will be attained. Data collection methods: Groundwater from monitoring wells is the typical medium for data collection and sample analysis, although soil samples are used at some sites for documenting performance. Groundwater samples are typically collected using established protocols (e.g., low-flow purging), but no-purge sampling and passive sampling methods are increasingly being adopted. Sampling locations: Locations are selected based on the site-specific objectives, but generally include enough locations to assess performance within a source area, downgradient plume expansion, receptor protection, and background conditions. LTM programs often rely on existing monitoring wells because they are implemented after site characterization has been completed, but additional locations may be necessary if there are changes to the conceptual site model. Analyses: At a minimum, samples should be analyzed for the contaminants of concern based on regulatory requirements. Additional parameters are frequently included, such as geochemical indicators (e.g., compound specific isotope analysis, molecular biological tools), to serve as lines of evidence that remedial performance or natural attenuation are occurring and sustainable. Quality Assurance Project Plan (QAPP): The QAPP defines data quality objectives and establishes how data will be collected, managed, and validated. Sampling Plan: Sampling frequencies can be tailored to the site objectives, but generally occur on regular intervals (e.g., semi-annually). Duration of the LTM program may not be specified at the outset, but tied to achieving the remedial performance objectives. Long-Term Monitoring Data Analysis occurs throughout the extended monitoring period, with the goal of evaluating contaminant concentration trends and progress towards goals. Data analysis relies on standard statistical methods and is often aided by the use of software tools. Commonly, more comprehensive periodic reviews (e.g., 1-3-5 year reviews) are used as formal evaluations of whether the remedy is achieving the RAOs. On-going or periodic data evaluation during an LTM program can also be used to support process optimization. The goal of long-term monitoring optimization (LTMO) is to ensure that sufficient data are collected to evaluate the remedial objectives while at the same time reducing the level of effort (i.e., cost) associated with the program (e.g., see below). LTM may involve the collection of data over several years or even decades, and thus can be a costly liability for stakeholders. For example, LTM constitutes a “large fraction” of the Department of Defense’s collective annual costs for managing their contaminated sites and is estimated to exceed $100 million annually. It is important to identify appropriate objectives for monitoring to ensure that endpoints are well-defined and understood. LTM data variability can complicate interpretation and make it more difficult to establish trends or compliance. Changes in site conditions can also prove challenging such as shifts in regulatory requirements, changes in site ownership, adoption of analytical methods with lower reporting limits, presence of emerging contaminants, and conceptual site model adjustments. Unfortunately, some LTM programs can suffer from inertia; site managers and other stakeholders are comfortable with the program and not receptive to changes. In other cases, the data may be getting only a cursory review, such that there is little attention to improving data quality or reducing costs. LTMO offers a way to avoid this, but it requires a higher level of short-term engagement to ensure that longer-term cost-effectiveness of the program is improved. Optimization has the potential to increase LTM reliability by closing data gaps and/or reduce long-term costs by determining whether fewer sampling locations, analyses, or sampling events will still generate adequate data to evaluate the remedial objectives. Figure 2. MAROS: A long-term optimization program. LTMO is considered a step-wise process, with initial steps focused on evaluating the existing conceptual site model, sampling and analysis program, and the LTM dataset. If the site is considered a strong candidate for optimization, agreement is reached on the type(s) of quantitative and/or qualitative evaluations that will be included and how they will be performed. The optimizations are then completed, typically using a software tool (e.g., MAROS; Fig. 2) designed to identify monitoring locations or even events that can be dropped as the program continues. The U.S. Environmental Protection Agency (EPA) provides an online seminar that presents tools for performing LTMO projects. The implementation of LTMO, including the use of MAROS and other optimization tools, has been documented at a number of sites. For example, LTMO was used at the Gilson Road (Sylvester) Superfund site to establish that the monitoring frequency for many wells in the existing network could be reduced to biennial, and that 26 monitoring wells could be eliminated from all future monitoring events without impacting data quality. A similar LTMO approach was used at the Kearsarge Metallurgical Corporation Superfund site where historical remedial activities had reduced the size of a chlorinated solvent plume to an extent that much of the monitoring network was determined to be unnecessary. The LTMO for the Kearsarge site recommended that 10 wells could be eliminated from future monitoring events because they were statistically “clean” (i.e., below compliance levels) and/or redundant, and all but a handful of wells could be switched to annual monitoring. Long-Term Monitoring (LTM) is used to monitor the progress of groundwater remediation, particularly for MNA projects. Key elements in the design of a LTM program include selection of which constituents to analyze, where to sample, and how frequently samples should be taken. Because groundwater is difficult to restore, LTM programs can last for many years and can be very expensive over the life cycle of a site. Therefore, there is an emphasis on applying Long Term Monitoring Optimization (LTMO) techniques to design LTM programs that still meet site objectives, but are more efficient and cost effective. This page was last edited on 20 June 2018, at 17:51.